"Heal. Vote. Inspire. Vote. Revive. Ben Carson 2016. Vote and support Ben Carson for our next president; it'd be awesome." So begins — wait for it — the Ben Carson rap ad, which was released Thursday. With Aspiring Mogul overlaid on snippets of Carson speeches, the 60-second advertisement apparently doesn't excite the Republican presidential candidate. In fact, he's kind of distancing himself from his own ad. Carson told reporters that it was the idea of some people on his campaign team, and that he probably wouldn't have gone this specific route. Why not? 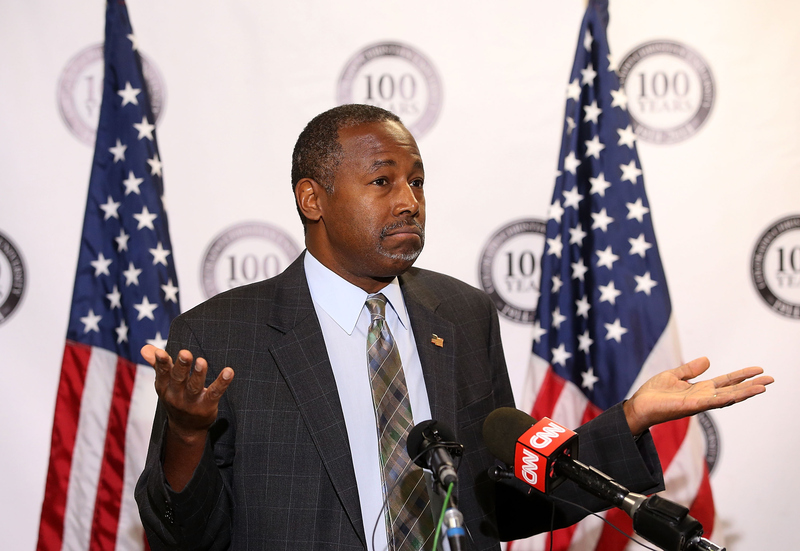 Well, Carson has previously blamed hip-hop for denigrating African-American culture. In fact, as Business Insider reports, he said that the black community was able to get through atrocities such as slavery, Jim Crow, and segregation because of faith, family, and values. But he continued, "and as we allow the hip-hop community to destroy those things for us, and as we grasp onto what's politically correct and not what is correct, we continue to deteriorate." Whoa. Carson later backtracked to say that he just meant aspects of current society which dismiss Jesus Christ. But as Yesha Callahan pointed out at The Root, there is such a thing as Christian hip-hop, and you can see religious influences throughout many rappers' songs. But regardless, it seems that Carson — or someone on his team — must have pushed his previous comments about the genre aside in an obvious attempt to blindly grab for any African-American vote he can get. According to I Side With, only about 37 percent of black voters said they would vote for Carson in 2016. “African-Americans fundamentally believe that the Republican Party does not care about black people, and that’s a very hard legacy to overcome,” Leah Wright Rigueur, a Harvard professor of public policy, told MSNBC. In fact, Kareem Abdul-Jabbar penned an op-ed for TIME bluntly titled "Ben Carson Is Terrible for Black Americans." He writes that while Carson can be a role model in terms of his morals, his medical accomplishments, and his success story, his opinions and questionable policies would be straight up awful. Much, much more awful than the terrible rap ad. Philip Bump of The Washington Post asked Talib Kweli what he thought of the song, and he put it pretty succinctly: "The most effective way for Ben Carson to reach out to young black voters is to actually care about other black people, which Ben Carson has proven to be incapable of." Kweli said that he actually thinks Jeb Bush has more respect for the black vote than Carson, and gave the song a grade of "F."
Even though Carson is currently the leading GOP presidential candidate according to several polls, seeing him make it to the Oval Office just feels so unlikely — whether it's because of ads like this or because his policies aren't good for African-Americans, women, or American in general. The ad ends, "If we wanna get America back on track, we gotta vote Ben Carson, a matter of fact. Go out and vote." We'll see how that goes.